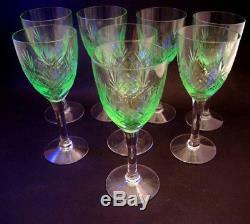 8 Vintage Holmegaard Else Crystal White Wine Glasses Uranium Glass. 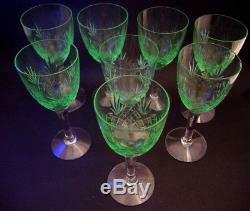 This beautiful set of 8 is in very good condition. 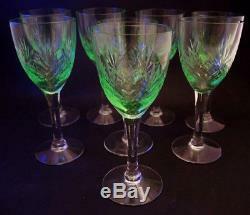 The glass is coloured with uranium which glows vividly under UV light although these glasses glow in normal light! 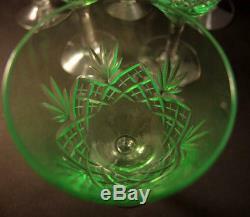 They were designed as a white wine glass and in today's standards would work better for a sweet sticky or fortified wine. The crystal is finely cut with a fan and criss cross design with fine cross cuts within the criss cross design. They are the first release of Else and more ornate with their cutting than the subsequent pattern released in 1923. There are no faults with the glasses, no chips cracks or clouding. The glasses are 150 mm tall and 59mm across the rims. Please note this item is original and not a copy or modern day reproduction. We do not mark merchandise values below value or mark items as "gifts" - US and International government regulations prohibit such behaviour. 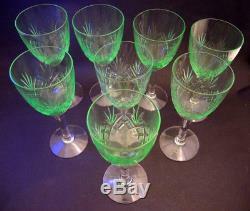 The item "8 Vintage Holmegaard Kastrup Cut Crystal Else White Wine Glasses Uranium UV Glow" is in sale since Saturday, March 10, 2018. 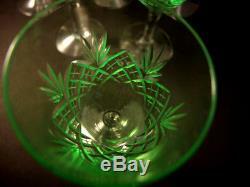 This item is in the category "Pottery, Glass\Glass\Art Glass\Scandinavian".